Blairgowrie Farm shop have had their Fresh produce vending machine running for just over a month now. “Sales have steadily risen and the customer feed back has been excellent” said owner Jennifer Steele. Blairgowrie Farm Shop is the first in town farm shop to install one the Roesler fresh food vending machines. They had the idea after finding out they were missing out on possible Sunday and evening trade. 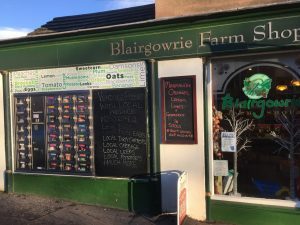 Blairgowrie has turned into a commuter town for Dundee and Perth so Blairgowrie farm shop wanted a way to engage with these potential customers. The people who do the daily commute may not get back to the town until 7pm so having the vending machine these busy people can shop at their convenience 24 hours a day. Mr and Mrs Steele are looking to have the machine stocked with seasonal produce all from the local area. If its in season it will be in the machine. If your passing through Blairgowrie pop round Reform Street and have a look at what’s on offer.